27th March 2019, New Delhi: Buying shares for a long term is considered by many, as a good mode of investment. 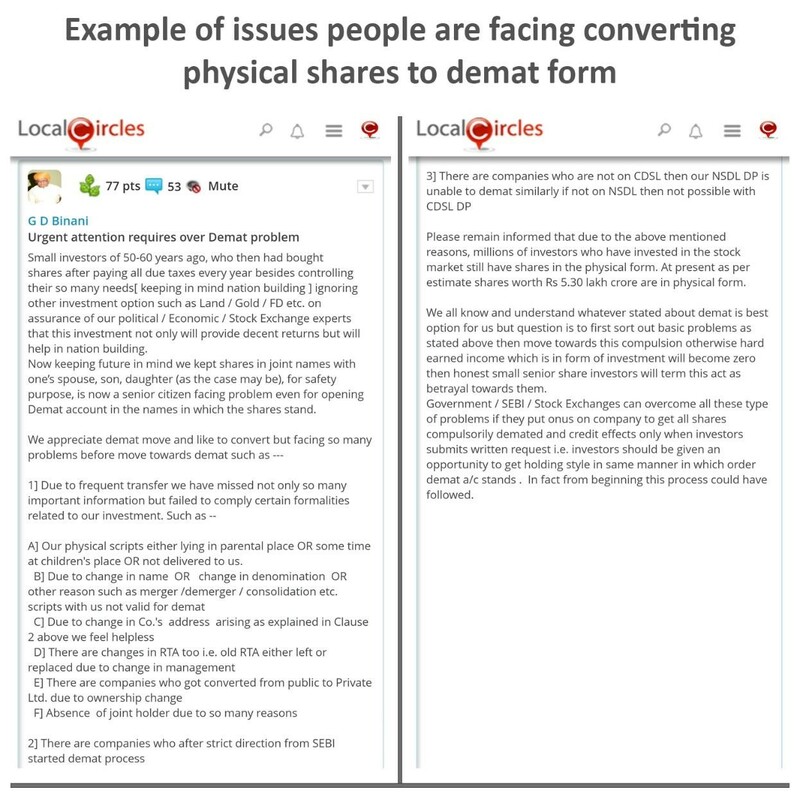 There are still many people who had purchased paper share of listed companies decades ago but never converted them into the demat form, as they did not want to trade them but reap the long-term benefits. They might be in for a shock soon. 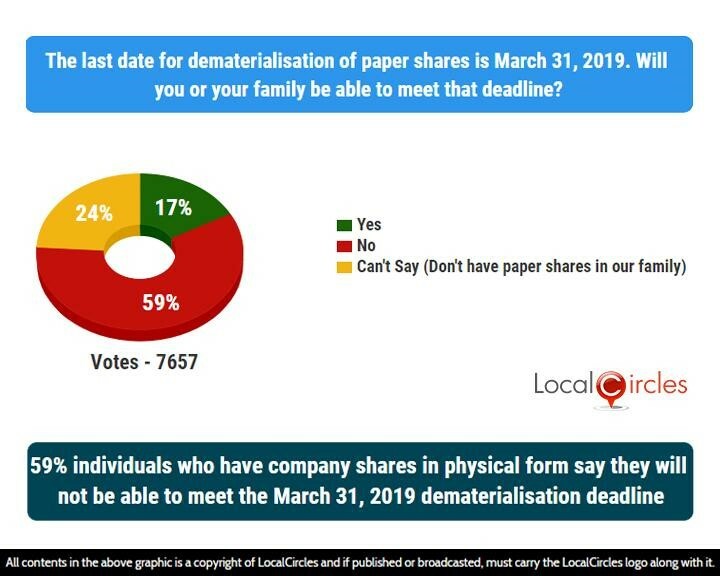 The last date of dematerialisation of paper shares is March 31st, 2019. This would mean that holder of paper shares will no longer be able to sell their shares without opening a demat account. 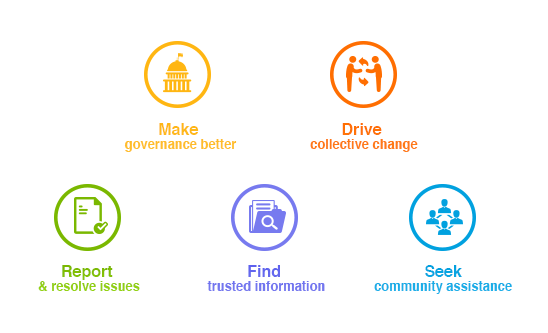 LocalCircles over the last month or so, received thousands of concerns and queries from citizens across India. To quantify the status, the root cause and the public pulse, it conducted a 3-poll survey to check what people feel about SEBI’s upcoming and its implications on them. In the first question, citizens were asked if they or their family will be able to meet the March 31st deadline. 59% said ‘no; while only 17% said ‘yes’. 24% said they don’t have paper shares in their family. Last year market regulator Securities and Exchange Board of India (SEBI) had decided that investors will not be allowed to transfer of shares unless they are held in a Demat form. The deadline was later pushed to 31st March 2019, after receiving many requests from the investor community. The next question asked if they are facing difficulties in getting their or their family’s conversion of paper shares to demat. 39% said they are facing issues with account opening/broker, company or have succession issues pending in court, etc. 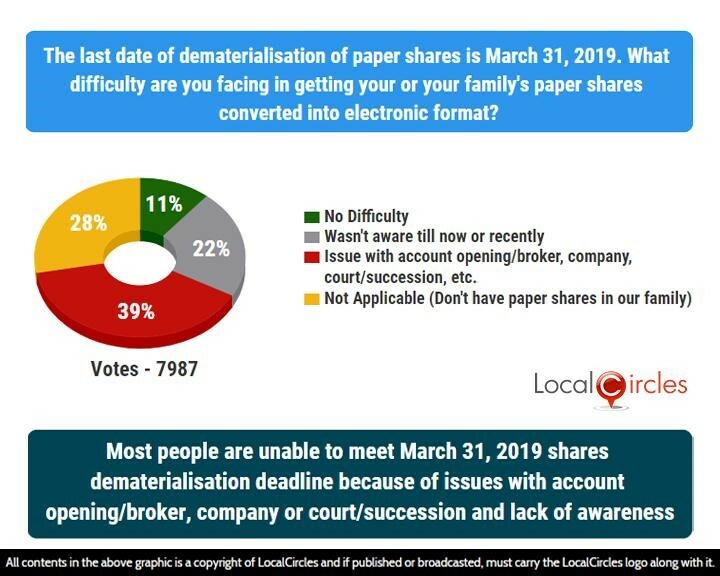 22% said they were unaware about this issue till now or recently and 28% said they don’t have paper shares in their family. Only 11% said they are not facing any difficulties at all. SEBI has said that except in case of transmission or transportation of securities, anyone wanting to trade physical shares will only be able to do it through a Demat account with a depository like CDSL or NDSL. The last question asked what the Government should do to help those who still haven’t been able to convert their paper shares to electronic/Demat form. 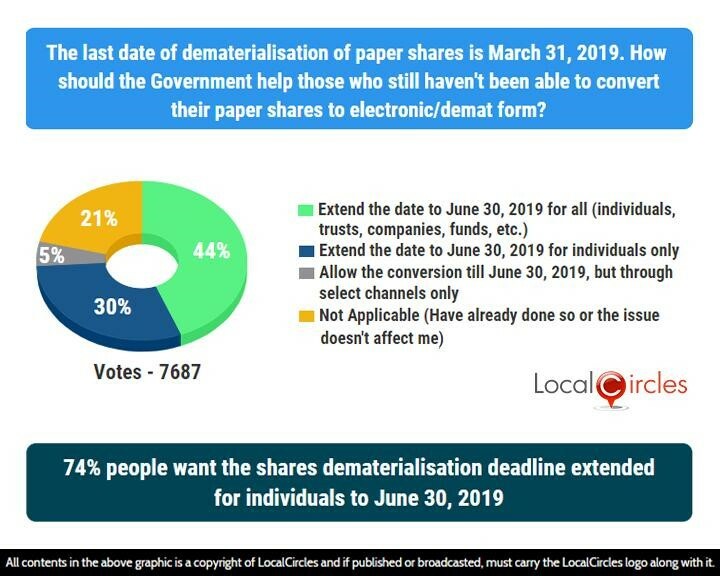 44% said the deadline should be extended to 30 June2019 for all including individuals, trusts, companies, funds etc. 30% said date should be extended to 30th June for individuals only. 5% said conversion of shares should be allowed till 30th June, but through select channels only. 21% said they either have already done it or the issue does not affect them. The results of the survey clearly show that citizens believe that the 31st March deadline is a bit unfair on them and majority want the Government to extend this deadline till 30th June 2019. LocalCircles will be taking up this issue with SEBI and Ministry of Finance so due consideration can be given to this issue. Some of the issues highlighted by people include rejection by transfer agents for petty reasons with investor charged for expenses like courier/postage. People having difficulty locating companies, delayed or no communication from most companies. In some cases, delays by courts if succession documents have to be processed. 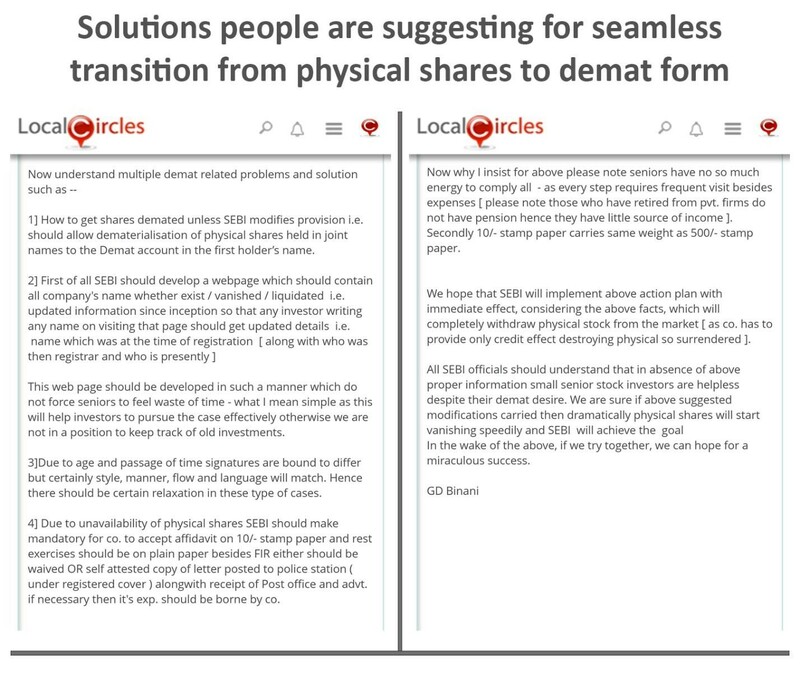 Some other issues mentioned by people include change in company’s address and registrar etc. Some solutions suggested by them also includes investors to be given some respite in case of lost shares and need for FIR to be removed, paperwork to be done on Rs. 10 stamp paper instead of a Rs. 500 stamp paper, and credit effect to be given by companies in demat account only etc. People want SEBI to put the onus on companies rather than individuals and create a special cell with a hotline within SEBI so issues faced by people can be addressed. More than 23,000 votes from 10,000 unique participants were polled from over 200 cities and towns across India. Approximately 29% participants were women, while the remaining 71% were men. 51% participants were from Tier 1 cities, 30% from Tier 2 cities and 19% were from Tier 3 cities and rural areas.